“Suspended sediments result from flood plumes, coastal agricultural and industrial development and from dredging operations and are increasing in coastal waters worldwide,” says study co-author, Dr Amelia Wenger. “Fish gills are in direct contact with their environment and are the first line of defence in the animal’s immune response, which makes them the perfect place to look for damage associated with sediment,” adds co-author Dr Jodie Rummer. “Plus, harm to this vital organ affects every activity in the animal’s body that requires oxygen,” Dr Rummer says. For the study, the researchers simulated sediment conditions frequently found on inshore reefs on the Great Barrier Reef, but they say the problem isn’t limited to Australian waters. Coastal oceans affected by suspended sediment tend to overlap critical fish habitats and nurseries. The research highlights the need for the continued protection of these crucial habitats. Juvenile reef fish are often exposed to sediment as they swim in open waters before settling on a chosen reef. During this critical developmental stage they need great amounts of oxygen, but damage to their gills makes it hard for them to get it. “The gills in sediment-exposed larval clownfish fish were congested, exhibiting twice as much mucous of what could be found in clean-water exposed fish,” says study lead author, PhD Student Sybille Hess. “Larval fish have very high growth rates. They’re swimming a lot, often over long distances. They have a very high metabolic rate and high-energy costs and need their gills to be working as efficiently as possible,” Dr Rummer says. The gills of affected fish were also found to harbor disease-causing bacteria. “The presence of bacteria linked to fish disease on the gills of sediment-exposed fish suggests that exposure to, and accumulation of, sediment may trigger the development of fish diseases,” says co-author Dr Tracy Ainsworth. “This research underscores the necessity for future coastal developments to consider the adverse effects of sediment on fish and reef ecosystems,” adds Dr Wenger. 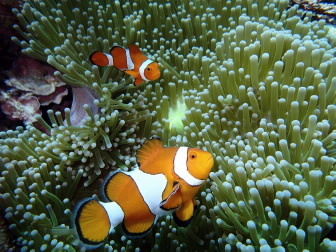 Exposure of clownfish larvae to suspended sediment levels found on the Great Barrier Reef: Impacts on gill structure and microbiome by Sybille Hess, Amelia Wenger, Tracy Ainsworth and Jodie L. Rummer is published in the journal, Nature Scientific Reports.